Werner's Cairns blog: Fluoride, the ubiquitous poison in our food and water. Fluoride, the ubiquitous poison in our food and water. Since the Queensland state election is imminent, it is important that the subject of compulsory water fluoridation has to be brought to the fore – once again. Water fluoridation is not only useless against tooth decay; it is also costly for the individual councils and subsequently the rate payers. The initial cost of water fluoridation, according to Anna Bligh, was $35 million, but this has blown out so far to over $113 million. What an exorbitant waste of money for something that doesn’t work. The LNP is saying that they want to stop waste, if they will form the next Queensland government, well, stopping this insidious practise will exactly do that. Not all fluoride is the same so it is important to understand this. Underground water (bores and artesian water) contain the natural fluoride, which is calcium fluoride. Even though this type of fluoride is natural, it still has the negative side effect of dental fluorosis making teeth brown and brittle and accumulating in skeletal bones.Click on image to enlarge. In contrast to the silicofluoride that our “Know-All” premier Anna Blight forced our councils to put in our drinking water and down our respective throats comes from China. This is a Schedule six (S6) poison and is a waste product from the fertiliser and aluminium industries and doesn’t do a thing to reduce tooth decay. This silico-fluoride crap is sourced from factory smoke stack wet pollution scrubbers and contains small amounts of heavy metals, such as lead cadmium and arsenic. It is an industrial grade product. Less than 2% of water is consumed and 98% goes down the drain, so one has to question the wisdom of this. Besides this, exposure to fluoride is implicated in adverse health effects for a significant number of vulnerable people (see the 2006 USA National Research Council Report Fluoride in Drinking Water) but this Bligh government doesn’t seem to care. For some unknown reason this government is hell-bent on disposing China’s toxic waste through our drinking water system and our kidneys. Please do not take my word for it on this subject - simply look at the abundant latest research and you would come to the conclusion that we have been misled by Anna Bligh and her health bureaucrats. This brings me to a quote by Adolf Hitler: “What good fortune for governments that the people do not think.” Unquote. I’m sure Anna Bligh would agree with Hitler and is glad that this is the case in Queensland and the rest of Australia. There are two books I highly recommend that are available at the library. Those books make compelling reading. 1. " Fluoride: Drinking ourselves to death?" By Barry Groves. 2. "The Fluoride Deception." By award winning Journalist and BBC producer Christopher Bryson. Do you enjoy tales of intrigue, conspiracy and corruption? Then “The Fluoride Deception” by Christopher Bryson won’t disappoint. It’s a very well written, meticulously researched exposé of the history of fluoridation, which Dr Robert Carton (formerly of the US Environmental Protection Agency) has described as “the greatest case of scientific fraud of this (20th) century, if not of all time”. It’s a history of “greed, collusion, personal aggrandizement, corporate and government cover-up,” littered with human tragedy and the tattered careers of scientists who dared to try to expose the truth. “The Fluoride Deception reveals how a secretive group of powerful industries, all of which faced extensive litigation for fluoride pollution, collaborated with officials from the National Institute of Dental Research to launder fluoride’s public image.” It also points out the significant and wide-ranging health concerns of long-term consumption of even minute quantities of this poison, for its supposed benefit in preventing tooth decay. Here is an extract. I quote: A Primary Source of Fluoride: Your Food! According to Green, non-organic food could account for as much as one-third of the average person's fluoride exposure! This is important, as many people are under the mistaken assumption that by avoiding fluoridated water, they've eliminated the primary source of fluoride. But if you're still eating conventionally-farmed foods, your fluoride exposure is still likely very high. "Cryolite is actually sodium aluminium fluoride... This sodium aluminium fluoride is especially effective at killing bugs," Green explains. "It's also very sticky, so when they spray it, it's more likely to stick on your produce, unless you're... really working at trying to get it off of it. As time has gone on, and... everybody said fluoridation must be really great, they ramped up the amount of residue [allowed on food] from these fluoride-based pesticides. They have petitioned the EPA to be able to allow it, and they come out with larger and larger [allowable] amounts." Amazingly, based on the assumed safety of such fluoride-based pesticides, iceberg lettuce can now contain a whopping 180 parts per million (ppm) of fluoride—that's 180 times higher than what's recommended in drinking water! "The assumption is that on a head of lettuce, you're going to peel off those outer layers and you're not going to eat much of that. Whether you do or not; that's up to you... Romaine lettuce and what we call leaf lettuce are allowed to have 40 ppm, with the assumption that it's down inside there and you're going to have to do more cleaning. But because it's so sticky, it's almost impossible [to wash off] unless you go back to the old ideas of the Fuller brush... produce brushes that you... scrape this stuff off with. The majority of people don't make that extra effort to be able to take it off." Citrus fruits are allowed to be contaminated with 95 ppm's of sodium aluminium fluoride. Potatoes may have 22 ppm's on the outside and up to two ppm's on the inside. Raisins can have up to 55 ppm's. But of all the foods, grapes are perhaps one of the foremost sources of fluoride exposure. Unquote. To read all of this, and I recommend that you should, for you own health’ sake. Click on this link. We are in a catch 22 situation. Talk to your politician about this; grow your own vegetables if you can and wash the bought ones in veggie wash with filtered water. Elucidate yourself with further reading. 1. Quotes from eminent scientists. 2. Firewater documentary: Australia’s Fluoridation Disgrace. 3. The case against fluoride, by The Case Against Fluoride” by Doctors Paul Connett, James Beck and H.S. Micklem. Michael Trout, LNP candidate for the state seat of “Barron River” on the northern side of Cairns is totally against water fluoridation and so is the whole LNP Barron River branch. Michael has promised that if he is elected he will take a resolution to the next LNP Party convention to make a case against fluoridation and it is hoped that it will be adopted and water fluoridation stopped. Darren Hunt, Katter Australia Party candidate for the state seat of Cairns Qld. stated in the Cairns Post 6.2.2012, in regards to fluoride in the water. I quote: “If you don’t want it you shouldn’t have it forced down your throat and your children’s throats. Unquote. Posted by Werner Schmidlin at 11:12 AM Labels: Fluoride Ubiquitous. Assurances of health and safety of water fluoridation are made by people who are protected by law from prosecution if it ever causes harm. Would you accept such an assurance from anyone on any other matter let alone your health, your very life. An assurance can only be given from the position of a personal guarantee, the person making the claim must be liable and be accountable. If you cannot take them to court to make good on their claims then there is no assurance. The politicians, health department bureaucrats, doctors and dentists can lie with impunity because they know they are 'protected people' under the Fluoridation Act. Do you still think they can be trusted with your health or mine? The TGA have not provided evidence to justify why fluoride is not considered a medicine or a poison in the poison standard yet it is claimed to stop tooth decay by killing the germs and repairing the teeth. If it does that then doesn't that make it both a poison and a medicine, neither of which can be legally put into a public water supply. It is time to act the protections afforded these promotors must be removed and the ADA and AMA must allow their members to tell the truth without reprisals. Water fluoridation and the issues behind it are much bigger than whether or not a child looses a tooth. It is our very freedom to choose the life we want, economically, politically, religiously, in fact whether we live at all. 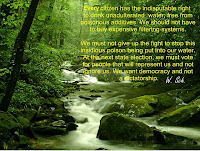 If you can't refuse to be poisoned then what freedom do you have. An excellent posting! I learnt a few things from it. Re Footnote, I believe that Michael Trout, the LNP candidate, if elected; will keep his word and do something about this awful mass medication, that was forced on us by Anna Bligh, without the people’s consent. I hope we see this authoritarian Labor government eliminated on the 24th of March. Poisonous Pollutant in Victoria we have "hydrofluorosilicic acid" forced on us, it makes me ill. Governments know full well what it is they are force feeding us; it is intentional in my opinion and a way of "legally" disposing of a hazardous waste product. Politicians do not care how much systemic damage it may cause, the strong will survive and at the same time population growth will be curbed. see www.fluoridationews.com;fluoridefreemurray.org;BAFF; Facebook links also. Every Queenslander must make sure that this authoritarian Labor government is swept from office on the 24th of March. Watching ABC’s Four Corners program made my blood boil. This bloody Labor Government is not only poisoning our drinking water with fluoride, but allows gas companies to poison our artesian basin with toxic chemicals and ruining the livelihoods of farming families. This is absolutely disgusting. 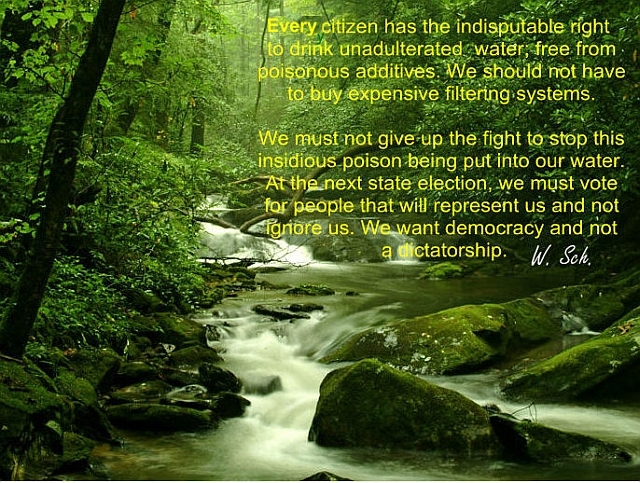 Thanks for another great article on water fluoridation Werner. As you know, I am a life member of the ALP, having over 40 years membership. I am proud to be a member of the ALP, however I disassociate myself from the Qld State parliamentary wing of the Party and especially Anna Bligh as leader. - She has taken away my rights to a clean water supply, free from the medication (fluoride). I do not want to ingest this poisonous medication, but It is forced upon me. It is a long term poison that can affect many parts of the human body. - It is like taking an aspirin every day. Eventually it will cause internal damage. - It will affect chemically sensitive people a lot sooner. Thank you, Werner, for this eye opening posting. Our family is totally against mandatory water fluoridation. This was an undemocratic act by this authoritarian Labor government. They seem to know best what is good for us without asking if we want or not. The 24th of March 2012 will be retribution day – can’t come quick enough. Years back I was a Labor man, but now Labor can ROT IN HELL. These Labor RATS are killing us with fluoride RAT POISON. Yes, I am emotional because I care about all living things and the environment. I am voting for Katter's Australia Party. Paul, if you want to have the Qld. Labor government removed, it is imperative to vote LNP, they may not be perfect, but we need a “complete” new broom in Brisbane and not one of which the handle belongs to a different party. Don’t waste your vote on the Katter party, we wouldn’t want to have the same problems we have now in Canberra. Re fluoride. Believe me, once Michael (LNP) is hopefully elected, I'll be onto our MP's like a tonne of bricks about fluoride. Re footnote. Our family is totally against water fluoridation. We will vote for Michael Trout; we believe in him that he will do something about this insidious undemocratic practice if elected. We were told that the whole LNP Barron River branch is totally opposed to mandatory water fluoridation. I also believe that fluoride is a ubiquitous poison in our water. But the big problem here is, I think most of the local water supplied in our house already has this substance. I hope Michael Trout can really help us with this issue.